Mr. Patrick Carton, consultant orthopaedic surgeon and a specialist in hip and groin surgery, has recently been appointed as ‘Honorary Research Associate’ to the Department of Sports, Exercise and Health Science at the Waterford Institute of Technology, Waterford City. Mr. Carton delivered a public lecture ‘The Sporting Hip’ to staff and students as part of this new collaboration between the Hip and Groin Clinic at Whitfield Medical Centre and WIT. “ This is a great opportunity for WIT and the Hip and Groin Clinic, based at Whitfield, to develop research links which will encourage funding and permit post-graduate research into ‘sports-related hip injury’, which is being increasingly recognised as a major problem in GAA, rugby and soccer”. Research into ‘the association of hip-related sports injury and ACL ruptures of the knee in athletes’ has recently been approved by the Institute’s ethical committee and Mr. Carton is co-supervising post-graduate research into performance assessment of athletes before and after keyhole surgery to the hip. Photo (WIT): Mr. Patrick Carton signs an agreement with Waterford Institute of Technology appointing him to the role of ‘Honorary Research Associate’ to the Department of Sports, Exercise and Health Sciences. 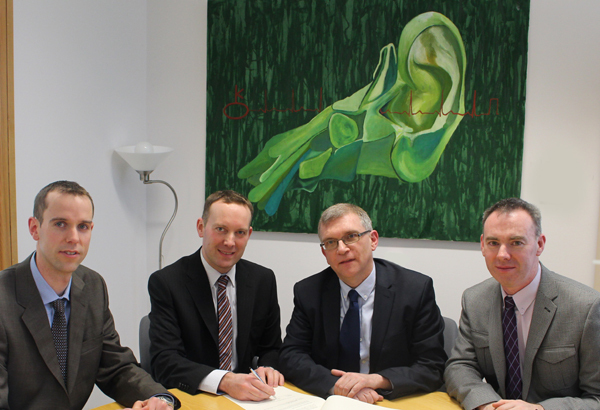 Also included in the photo (L-R) Dr. Mike Hanlon, Prof. John Wells and Dr. Michael Harrison from WIT.